A quadratic form, mathematically speaking, is an application of a vector space to real numbers (we are a function that takes us from a vector space – which does not have to be vectors, but has elements that can be represented as vectors, which I know you, you’re going to jump-to a body K of scalars, usually the real numbers). Typically, ordinary people know it as equations where one of the members is squared and in fact, there is nothing superior to this square. In fact, to quadratic forms, if we go to the algebra of the whole life, they are defined through a matrix and that, therefore, they fulfill or can be played with them through all the properties of the matrices, like For example, facilitate classification. In fact, matix of the quadratic forms have a very cool appearance and are diagonal matrix (whose matrix can be decomposed into a series of multiplications of matrices in order to convert it into an array with only diagonal elements). This, diagonalization, the ability to be diagonal, is one of the most used properties (although many do not know or do not realize) to remove the square binomials. 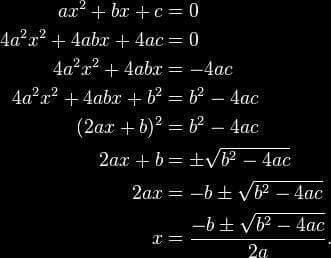 That is, when we do the typical binomial we are actually diagonalizing the matrix. Moreover, as a good diagonal matrix, it is inversible and therefore, in a system of equations has solution. Another story is how solutions are. And no, I will not go into the eigenvalue issues of a quadratic form and the vector spaces with their vectors referring to the diagonalization of the matrix, because that would give for much. But, at least, I tell you “above” if you are interested, to look for more information. The origin of the quadratic forms comes from 1801, where they appeared in the Disquisitiones Arithmeticae where Gauss, in his work and determination to help us solve systems of equations, studied a specific type of equations (quadrats) and how they could be solved (or When to know when they can be resolved so as not to waste time). Cauchy, in 1812 and his play with determinants (and his obsession with eigenvalues ​​and therefore the diagonilization that I tell you above) is the culprit of the search for simplification. Later Hamilton and Cayley, about 1850, were responsible for realizing that the quadratic forms had a base of vectorial space and treat them as applications and linear transformations. Finishing the knowledge and uses of these elements so necessary and used in, for example, economics, although the economists do not give the importance that they really have.